We welcome you to bring a group to work alongside Mike & Martha in Honduras. 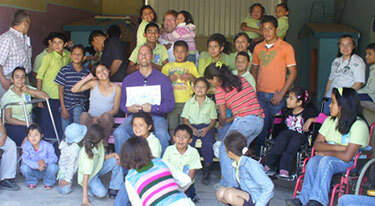 Activities for teams with Good Word Ministries usually focus on working with special needs children. This is an amazing and unique opportunity for making disciples, which teams can do very well. These children are easy to work with, being very accepting and thankful for attention as well as lots of fun to be with. You can expect to get more encouragement and joy than you give, as spending time with them is rewarding to everybody involved. There are also opportunities for helping the older Deaf to develop spiritually, vocationally and academically. Whether you have specific gifts or skills for these types of service, or just want to help as the Lord gives you opportunities, you are most welcome to come down. A variety of great experiences are waiting for you! Please contact us at mjrudd1@msn.com for more information. We welcome your communication! Do not let this Book of the Law depart from your mouth, but mediatate on it day and night, so that you may be careful to do everything written in it. Then you will be prosperous and successful.